Real gross domestic product (GDP) growth accelerated to 0.7% in the second quarter, following a 0.4% gain in the first quarter. Meanwhile, final domestic demand rose 0.5%. Growth was mainly driven by a 2.9% increase in export volumes—the largest gain since the second quarter of 2014. Exports of goods, led by energy products, rose 3.6% after increasing 0.3% in the first quarter. Exports of services edged down 0.2%, the first decline since the fourth quarter of 2015. Household spending rose 0.6%, after increasing 0.3% in the first quarter. Outlays on services (+0.8%) was the largest contributor to the increase. Rebounds in semi-durable (+1.2%) and non-durable (+0.2%) goods and continued growth in durable goods (+0.5%) also contributed to the gain. Businesses continued to accumulate inventories, adding $13.4 billion to their stock, following a $16.0 billion increase in the previous quarter. Both non-farm and farm inventories rose in the second quarter. Business investment in non-residential structures (+0.5%), machinery and equipment (+0.3%) and intellectual property products (+0.2%) all decelerated in the second quarter. Housing investment grew 0.3%, following a 2.7% decline in the previous quarter. Expressed at an annualized rate, real GDP was up 2.9% in the second quarter. In comparison, real GDP in the United States grew 4.2%. 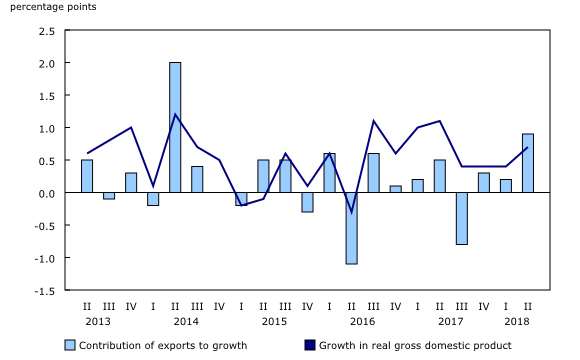 Growth in export volumes accelerated to 2.9% in the second quarter, due in part to notable increases in energy products (+5.6%) and consumer goods (+6.3%), particularly pharmaceutical products. Exports of aircraft, aircraft engines and aircraft parts (+13.4%) increased sharply on higher shipments of business jets to both the United States and non-US countries. Exports of services edged down 0.2%. Total import volumes rose 1.6% in the second quarter, compared with 1.0% growth in the first quarter. Imports of goods increased 1.7%. Imports of refined petroleum energy products rose 45.1% to offset the complete shutdown of four Canadian refineries in April and May. These shutdowns typically occur once every five years. Additionally, aircraft and other transportation equipment and parts grew 9.1%. Imports of services (+1.1%) rebounded following a 0.8% decrease in the previous quarter. Household final consumption expenditure increased 0.6%, twice the pace of the first quarter and reversing the downward trend over the previous three quarters. Growth was largely attributable to outlays on services (+0.8%), which outpaced outlays on goods. Housing-related expenses (housing, water, electricity, gas and other fuels), up 0.6%, contributed the most to the widespread growth. 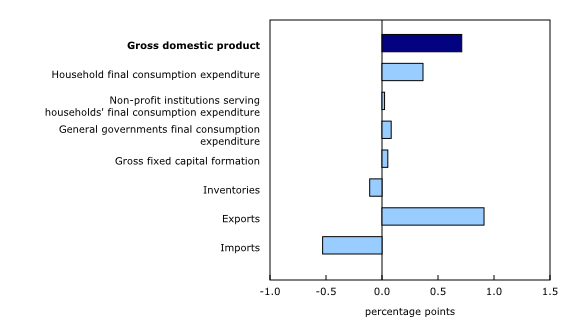 Spending on goods grew 0.5% following a flat first quarter, with rebounds in semi-durable (+1.2%) and non-durable (+0.2%) goods. Purchases of vehicles declined 0.5%. Investment in housing increased 0.3% in the second quarter, following a 2.7% drop in the first quarter. Declines in ownership transfer costs (-3.4%) continued, while new constructions (-0.3%) contracted for the first time since the third quarter of 2016. However, these declines were more than offset by a sharp 2.9% increase in outlays on renovations. Business gross fixed capital formation increased 0.4%, the slowest pace since the fourth quarter of 2016, as investment growth in non-residential structures, machinery and equipment, and intellectual property products all decelerated in the second quarter. Machinery and equipment investment rose 0.3% following a 3.9% increase in the first quarter, with aircraft and other transportation equipment (+5.8%), industrial machinery and equipment (+0.7%) and computers and computer peripheral equipment (+1.8%) accounting for the majority of the growth. Businesses added $13.4 billion to inventories in the second quarter, less than the $16.0 billion accumulated in the previous quarter. Most of the accumulation came from wholesalers (+$9.0 billion), with manufacturers (+$2.8 billion) also adding to their stock. Investment in retail inventories declined to $0.5 billion, while farm inventories increased $0.9 billion. 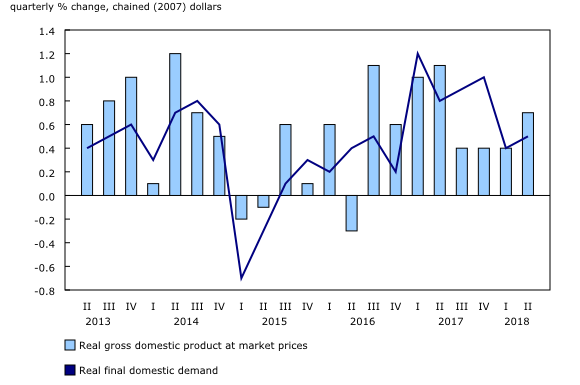 The GDP implicit price index, representing the price of goods and services produced in Canada, increased 0.5% in the second quarter, while real gross national income (the real purchasing power of income earned by Canadian-owned factors of production) rose 0.7%, the same pace as real GDP. Gross operating surplus (in nominal terms) grew 2.1%, compared with a 0.5% gain in the first quarter, as earnings of energy producers were boosted by higher crude oil prices and volumes. Household disposable income rose 0.7%, up slightly from the previous quarter (+0.6%). Compensation of employees increased 0.7%, the slowest pace since the third quarter of 2016. The household saving rate fell from 3.9% in the first quarter to 3.4% in the second quarter, as household spending outpaced disposable income. Unless otherwise stated, the growth rates in this release represent the percentage change in the series from one quarter to the next, such as from the first quarter of 2018 to the second quarter of 2018. Starting with the second quarter 2018 release, the debt service ratio table 36-10-0435 (formerly CANSIM 380-0073) will be published in the quarterly release of the Financial and wealth accounts in table 11-10-0065: National balance sheet accounts, debt service indicators, households on September 14. A mapping between the current and new series will be available upon request. Data on GDP for the second quarter have been released along with revised data from the first quarter of 2018. These data incorporate new and revised data, as well as updated data on seasonal trends. Real-time tables 36-10-0430-01 and 36-10-0431-01 will be updated on September 10. Data on GDP by income and expenditure for the third quarter will be released on November 30.